최대 20 mW의 레이저 파워 계측용 테라헤르츠 검출기. With state of the art pyroelectric sensors, measure down to 50 nW with 1 nW resolution. Each head can be connected to an oscilloscope using the analog power module (T-RAD-ANALOG) or directly to a PC with the digital power module (T-RAD). 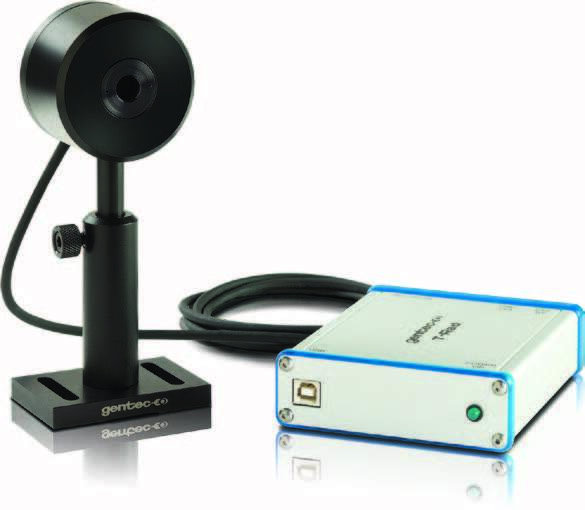 THZ-B detectors are calibrated at a single wavelength (0.63 µm) and include typical wavelength correction data from 0.25 to 440 µm. They are used for relative measurements outside that range. 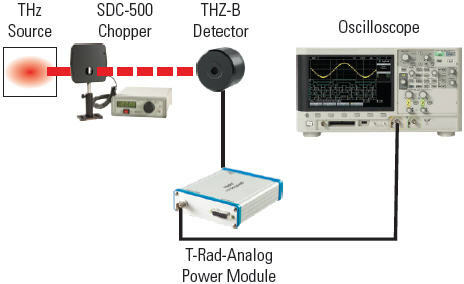 All THZ-B detectors require the use of an optical chopper, like our SDC-500, to sync the signal at either 5 Hz (DA models) or 25 Hz (DZ models). Digital (USB) power module, to interface THZ-B heads with a PC (software included). Analog (BNC) power module, to interface THZ-B heads with an oscilloscope. 1. 예측 스펙트럼 범위. 10~440μm에서의 분광계 측정. 440에서 3,000μm에서는 상대 측정만 가능합니다. 이 스펙트럼 범위는 변경될 수 있습니다. 2. SDC-500 디지털 광학식 초퍼는 별도로 판매됩니다. The T-RAD is a microprocessor-based digital radiometer that includes a 12-bit ADC and unique DSP lock-in software. It is powered by a USB connection, which also acts as a virtual COM port. When a THZ-B terahertz pyroelectric detector is plugged into the T-RAD module, the module reads the content of the head's EEPROM, which identifies the detector and provides calibration and wavelength correction data. 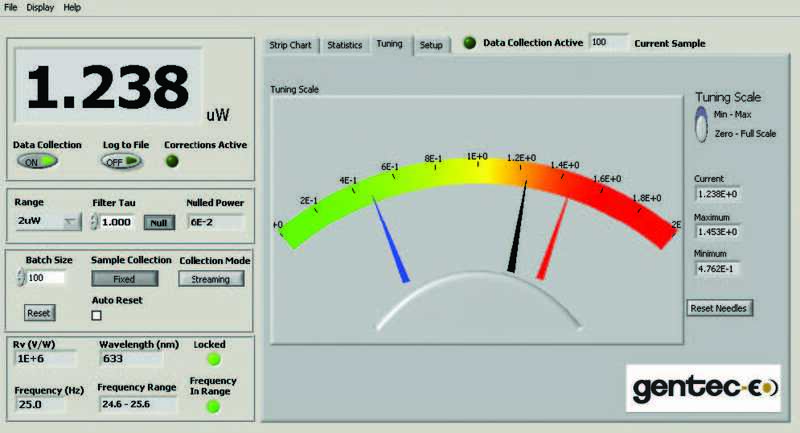 The LabView software supplied with the device makes it very easy to set up the radiometer, measure a THz or broadband source and record data. The software is compatible with Windows XP, VISTA and 7. Instrument controls and the radiant power measurement are always visible, making it easy to change the radiometer settings, no matter which display tab is selected. Instrument controls include: range, filter tau, batch size, data collection mode, reset options, and a null button for background cancellation. In addition, there are more set up and operation status indicators including: detector Rv, wavelength, frequency (actual), locked and frequency in range lights. 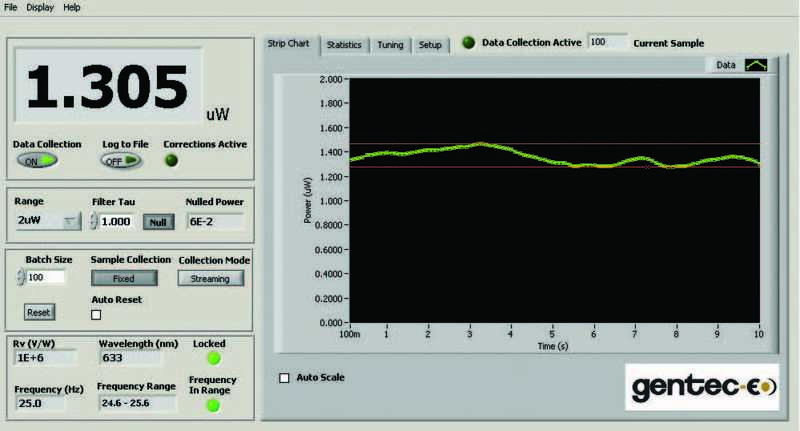 The strip chart displays the radiant power measurement in watts, either continuously or by the batch. Select full scale, auto scale or use our manual scaling option. The "tune" tab selects the very useful "tuning needle" display. This is a simulated analog meter whose speed is determined by the "filter tau" setting. It is expected to be used during the set-up of a radiometer with a source. The "tau" value is usually set to a small value when aligning the probe to the source (i.e. when peaking the reading). There is a button control to select "full scale", "min-max" or "reset". In the "min-max" mode, the indicators are "blue" for the minimum power and "red" for the maximum power. In the "Statistics" tab there are 4 large windows that contain the statistics for the selected batch, including: Minimum, Maximum, Standard Deviation and Mean, expressed in Engineering Notation. Standard Deviation can be displayed in Watts or as a % that is user-selectable. 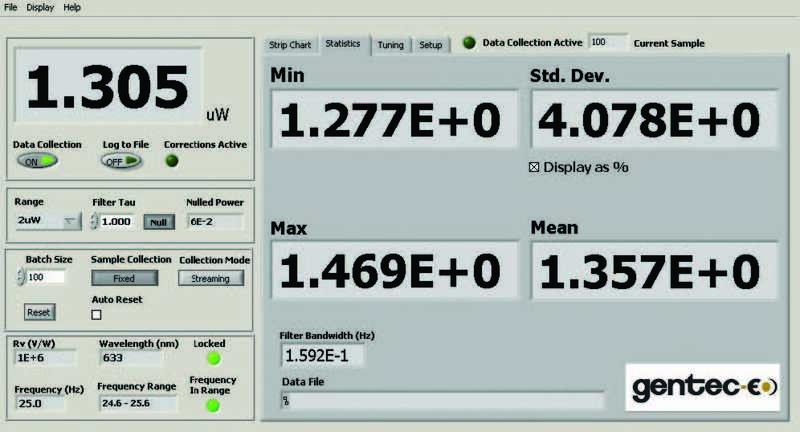 There is also a window that shows the bandwidth of the Digital Band Pass Filter based on the user selected "Filter Tau" (0.100 to 100 seconds). A lower time constant is helpful when setting up, and a longer one when making measurements, especially on the lower ranges of the instrument. Here is a basic analog set up that would be useful if the optical power of the source was about 5 µW or greater. The output of the THZ5B-BL-DA detector would be approximately 600 mV @ 5 Hz chopping frequency, giving plenty of signal for an oscilloscope. Simply read the voltage output and divide by the Rv factor (V/W) of the detector to measure the intensity of the source in Watts. Also consider applying a wavelength correction factor under certain circumstances. This is another analog set-up option that we recommend if you have to measure very low power levels (i.e. less than 5 ?W) where the signal may be buried in the broadband noise. 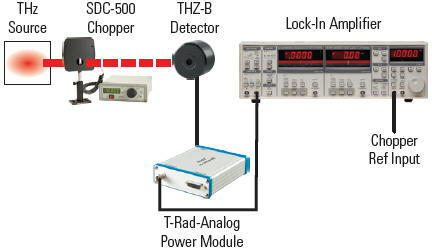 The voltage output of the analog THZ-B-DA detector, powered by our T-RAD-ANALOG, is routed to the Lock-In Amplifier input, and the Sync Output of our SDC-500 Chopper is connected to the reference input. The Lock-In Amplifier will lock on the chopping frequency and you can dial in a long integrating time and measure a very low RMS voltage. The voltage divided by our Voltage Responsivity (V/W) equals the power of the source. 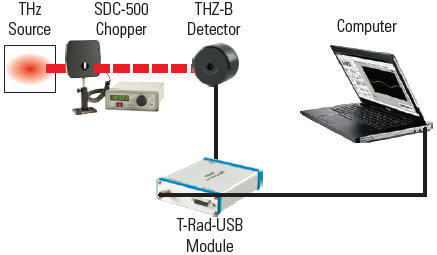 Although analog solutions are available, for simplicity, convenience and sensitivity, we recommend you choose our THZ-B-DZ detectors and the T-RAD digital radiometer. Our unique DSP Lock-In Amplifier software provides a function much like the Analog Lock-In, but is so much easier to use. It also addresses thermal drift of the sensor and allows you to display the power measurement and complete statistics directly in digital and graphic formats. Set the range, null the background, set the filter tau (bandwidth) and make the measurement. It's that easy!